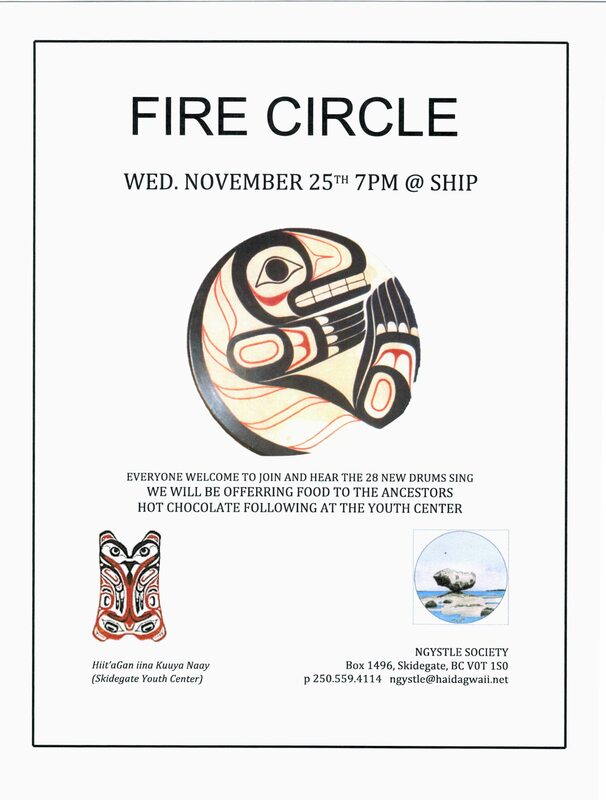 In partnership with the Skidegate Youth Centre, we’d like to announce that our 3 drum making workshops came to completion with a traditional fire circle under the full moon on Nov. 25th. For the workshops, Lydia Robichaud was the Cultural Facilitator and Galaa (Clayton Gladstone Jr.) was the Artist Facilitator. Each workshop was successful with a lot of fun and laughter. The energy of spirit and connection was amazing. The Lyell Island song was sung with great pride. The Monitoring and Evaluation portion of Skidegate’s Comprehensive Community Plan suggests that the number of drums in a community is a great measurable indicator supporting the cultural health of a community. This project created 28 more drums in Haida Gwaii. We were pleased to have the support of parents or family who came with the younger children to be a part of the group. Haaw’a to parents and family and to Elders Algyaa.adad (Betty Richardson), Yaahldaajii (Gary Russ), and Dewekiekillaf (Freddie Russ) for volunteering their time with their presence of interest, support, and story telling. We greatly appreciate the funding for one drum making workshop by New Horizons of B.C. Seniors and the funding for the other two by Gwaii Trust. We are very grateful to Skidegate Band for Proposal writer Gid uuwans (Dana Moraes). LaaDaa (Colin Richardson) led a beautiful fire circle under the full moon to complete the drum making ceremony. The opening prayer was spoken in Haida by Jiixa (Gladys Vandal) and Kuna ajaad (Jenny Cross) made a food offering to the ancestors. This was followed with so much heart in sharing of stories, songs, prayers, offerings, and presence. Singing and story telling continued indoors with cookies and hot chocolate at the Youth Centre. With participants ranging from young children to elders, it was a wonderful way to hear the new drums enter the community and reverberate through the hearts of multiple generations here on Haida Gwaii. We hope we have spelled everyone’s Haida name correctly, if not please phone us 250-559-4114 and we’ll correct it right away.